I'll lay it out bluntly for you; either the American people—not extremists, but good and decent patriots like your neighbors and yourselves—will revolt and destroy the ruling class and reform our government based upon first principles, or the United States we know as our forefather conceived it is dead. I do not state this as hyperbole. I do not state this to incite violence. I state this as nothing more or less than an observation of both history and current events. While we are a relatively young nation, our government is the oldest on the planet. Since our founders met in Philadelphia, the French have gone through five republics. Every nation in Europe, Africa, Asia, South America and North America has seen governments rise and fall, but our resilient democratic republic, the "Great Experiment," has soldiered on. All cultures and governments, however, rot. This inevitably comes from inside, as a cancer. Our politicians view the people as rubes and subjects, and treat them as such. They imagine themselves a ruling class that exists for their own edification, at the expense of the nation as a whole. When nations reach this point, they either collapse, or the people reform or replace their governments. The American people have become victims of our own complacency, and we've allowed the ruling class to divide us along lines of race, class, age, economic status, geography and gender. With a house so divided, the ruling class continues to maintain power by pitting one group against another. Social Security and other entitlement programs grow unchecked and unreformed because the ruling class uses the fear, uncertainty and doubt among seniors to quash any attempt at fundamental change. Illegal immigrants flow across the southwestern border because the ruling class uses race and ethnicity to paint real reformers as bigots and xenophobes. The list goes on and on and on, and the "good and decent patriots like your neighbors and yourselves" are simply fed up with it. This is a center-right country currently being ruled by a radical, elitist cabal masquerading as center-left benevolents. Every piece of legislation and every regulation promulgated under existing statute is a never-ending march against the basic principles and liberties this country was founded on. The cabal says one thing and does another and deliberately misleads the American people. Healthcare reform won't cost a dime. Your taxes won't go up a dime. Financial regulation reform is for the good of the consumer. A growing majority of Americans are seeing the truth and this charade is either coming to a stop--very soon--or the nation will implode upon itself. 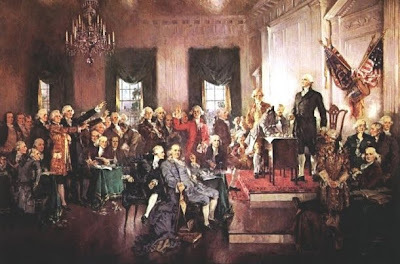 With this Article, our founding fathers gave the people a peaceful path to remove tyrants and reclaim liberties surrendered or abrogated by the ruling elite. While Article 5 sets the bar for reform quite high, the mood of the good and decent people suggest that the appetite for it is real. I live in Alabama and therefore can't vote to oust Nancy Pelosi. But I can lobby my state legislature to pass a resolution calling for a Constitutional Convention. Maybe you live in Texas and can't vote to oust Harry Reid, but you can help build a reform coalition in the Texas state legislature. We can take our country back, and we will do it one state at a time, just like our forefathers did. We have to, or our Great Experiment might soon come to an end, and we will have to explain to our children and grandchildren why we didn't have the courage to stand up, fight, and eject the ruling class. You might want to let people know about www.foavc.org. Here the applications the states have submitted can be read.